He graced the stages of the Stratford Festival for close to 55 years. He Performed with legendary actors John Guilgud, Maggie Smith, Alec Guinness, Christopher Plummer, Sybil Thorndike and Jessica Tandy. He was among those performers that transcended the title of actor as mortal. He was a true Canadian and remained one regardless of lure of higher success or monetary wealth. As Soulpepper Theatre company' s Artistic Director Albert Shultz has put it. "As an artist and as a man his gifts are impossible to count. We will not see his like again". William Hutt dead at 87 due to complications from Leukemia. William Hutt was born in Toronto on May 2nd 1920. Though the theatre was a place he seemed drawn towards at an early age, he was dismayed from it by his family and only performed in school productions. From 1941-1946 he served in the Seventh Canadian Field Ambulance corps on the European fronts in World War II. Traveling around often and witnessing the horrors of humankind gave him a strong perception of the emotion and human spirit he would begin to portray for the following 60 years. "I was so young at the time," recalled Hutt in a Maclean's article, "and I was introduced to death before I was introduced to life. Seeing that young blood spread over the fields of Italy and France, I became cognizant of the value of the individual soul, and that has had a great effect on my feeling about the roles I play..."
Returning to Canada a decorated solider, Hutt studied at the University of Toronto 's Trinity College and acted at Hart House Theatre . He made his professional debut in summer repertory in Bracebridge, Ont. He continued to work steadily until he joined the Stratford Festival in its first season in 1953. He was 33 years old. He toured with the company around the globe and performed at the festival appearing in more than 100 plays at Stratford including all the great Shakespearean roles from Brutus in Julius Caesar, to Hamlet, Macbeth, Falstaff and Titus Andronicus, to his final performance as Prospero in The Tempest in 2005. Part of his genius was his ability to slip into any role seamlessly and not only get pegged down in one type of role. Though he played various roles outside of Stratford in London and New York, including roles on in Albee's Who's Afraid of Virginia Woolf and as James Tyrone in O'Neill's Long Day's Journey into Night, he preferred to remain in Canada where he felt most welcome and happy. His need to infuse the arts here was ferocious and he became a role model for artists all over the country. "I think he was very brave to stay in Canada. He was very loyal and courageous in deciding to maintain the standards of his country", said Christopher Plummer. 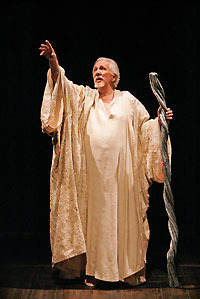 Though he had retired after his performance in Soulpepper's Waiting For Godot in 2004, he returned to play Prospero in The Tempest to glorious reviews that touted his brilliance at natural and underplayed nuances that captured the audiences' imaginations and held them captivated throughout every performance. He had intended to return this season to perform in Edward Albee's A Delicate Balance, as a tribute to outgoing Artistic Director Richard Monette's final season. In March of 2007 he was forced to pull out of the role and was diagnosed with Leukemia. He died this week in a Stratford hospital in his sleep. A recipient of every major theatre award in Canada, as well as a Governor General's Award for lifetime achievement, he was made a companion of the Order of Canada and will always be remembered as Canada's greatest theatre actor. Something legends are made of and something that every actor should strive to become. A proud, modest and hard working lion of the stage who inspired everyone around him as well as generations that will never have known or seen him but will certainly know of him.